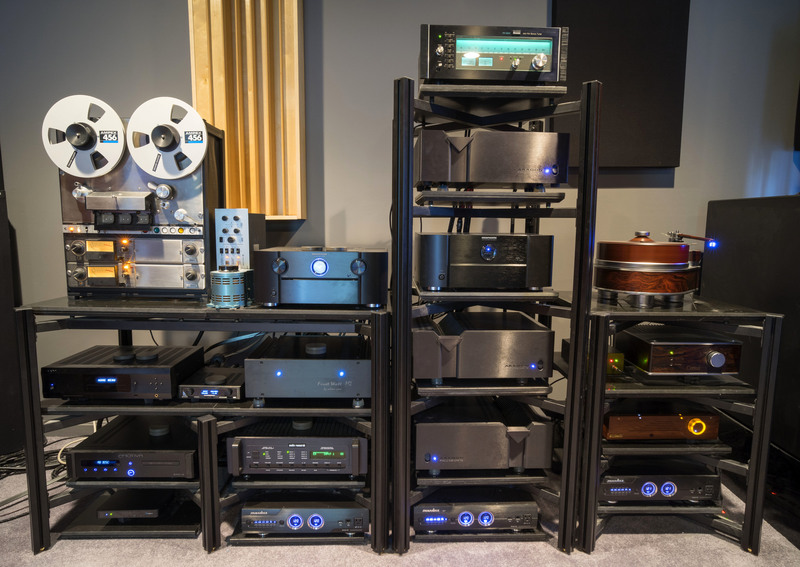 Show us your Audio Rack! My home made rack, consisting of 27mm Beech wood, 30mm screwed rod, with half thickness nuts & washers, 40mm Oak plinth. Track Audio Isolation feet under the rack and also on the turntable plinth. Just changed to this new rack. Wood and Steel. These are my Adona racks. My racks -- a good friend was the owner of a plastics manufacturing plant (made counters, displays, etc.) and using 4x8 sheets of 1 inch black acrylic & a CNC machine, he first made himself some shelving. He had a machinist friend mill the supports from billet aluminium and drill/thread each. Stuff is damn tough -- I've stood on the 2d level during TV install. Pretty too but as Dan would point out a dust magnet (well maybe not a magnet -- I can't find a rag & don't prep for a room inspections). I like it --. Unfortunately my friend got sick and sold his plastics factory. Fortunately, obtained a couple shelves for the dCS gear from a client of his. Have plenty of supports in various sizes to accommodate a rearrangement if needed. This rack is gorgeous! How does it perform? There isn't much info in it, and the same "ultrasound" is unfortunate considering it's popularity in the medical industry. All custom work out of Houston. The guy that runs it is top notch. Situated directly behind the tube monoblocks are low speed silent 120 mm fans. A rear wall section on this stand made these easy to add along with associated speed controller and power supply. Also added an LED back light for accent lighting. Great versatility for my ever changing setup. Last edited by Legrace; 02-04-2019 at 01:54 PM.